Home Uncategorized CityDig: The Colorful Rebirth of Olvera Street in 1930 L.A.
CityDig: The Colorful Rebirth of Olvera Street in 1930 L.A. 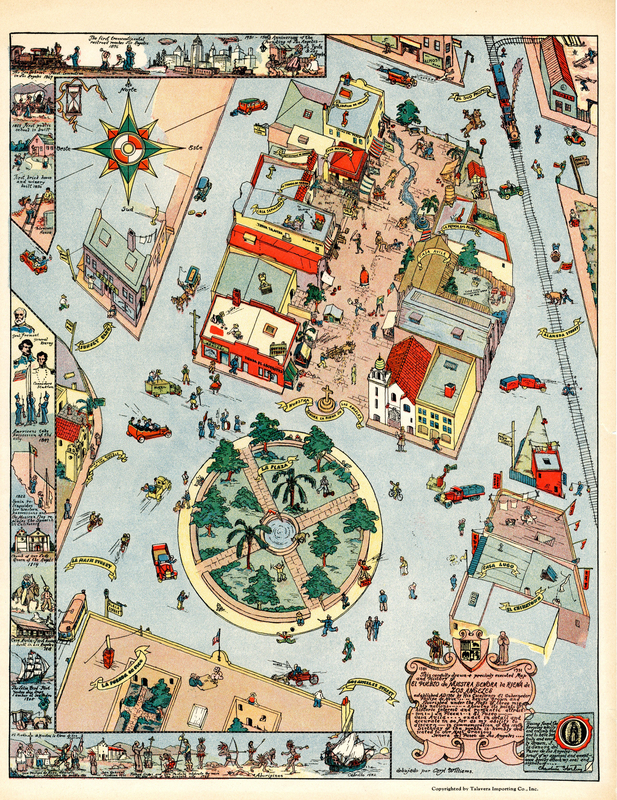 The colorful graphic arts of the 1930s decorated the whimsical pictorial maps that became popular during that decade, and especially in those that encouraged tourists to visit Los Angeles. Here’s a delightful example capturing Olvera Street at its very beginning, so to speak. Originally called Wine Street and renamed Olvera in 1877 (after pioneer Augustin Olvera), the humble alleyway was given new life by preservationist/campaigner Christine Sterling with the help of historically minded Angelenos and some cash from Los Angeles Times owner Harry Chandler. Sterling had a dream to restore the run-down area at the heart of what was then Sonoratown to a romantic vision of Mexican colonial Los Angeles. At first she pushed only to save the Avila adobe, the oldest building in the city, but the grassroots movement Sterling started eventually worked to reclaim the entire plaza in the late 1920s. With financial backing from Chandler and a rather unusual assist from Police Chief James Davis, who provided convict construction crews, the area was reborn as a tourist center on Easter Sunday, 1930. This map, which marks the 150th anniversary of the establishment of the Pueblo, was made by an artist who had her studio in Olvera Street and produced by a company from Pasadena with an “imprimatur” by Christine Sterling herself. It is quaint, quirky, and somewhat irreverent with its scenes from antiquity and popular culture. It also includes historical events such as Father Crespi and Portola celebrating mass on the site of the city in 1769, the establishment of San Gabriel Mission in 1771, the creation of the Pueblo at the direction of Governor Felipe DeNeve in 1781, the founding of the Plaza Church in 1814, the construction of the first brick home (Pelanconi house, or Casa Golondrina to locals) in 1850, and the arrival of the railroad in 1876. Seen also are bits of local color like an early film crew, the Salvation Army at work, the puppet theater Teatro Torito, a tour guide shouting into a megaphone, a soapbox orator, and one of the Chinese laundries in the area, and the lengthy Zanja Madre, which seems to run about a hundred feet within Olvera Street here. The artist also displays her sense of humor: there’s a cop chasing a criminal and even men in sombreros hoping for a lucky “siete” while playing a game of craps up on a roof. Los Angeles Public Library map librarian Glen Creason shares a map from the Central Library’s collection at CityThink each Thursday.